Passenger railway systems are highly complex systems requiring the solution of several planning problems that can be analyzed and solved through the application of mathematical models and optimization techniques, which generally lead to an improvement in the performance of the system, and also to a reduction in the time required for solving these problems. The planning process is generally divided into several phases: Line Planning, Train Timetabling, Train Platforming, Rolling Stock Circulation and Crew Planning. In this paper, the Train-Unit Assignment Problem (TUAP), an important NP-hard problem arising in the Rolling Stock Circulation phase, is considered. In TUAP, we are given a set of timetabled trips, each with a required number of passenger seats, and a set of different train units, each having a cost and consisting of a self-contained train with an engine and a set of wagons with a given number of available seats. TUAP calls for the minimum cost assignment of the train units to the trips, possibly combining more than one train unit for a given trip, so as to fulfill the seat requests. 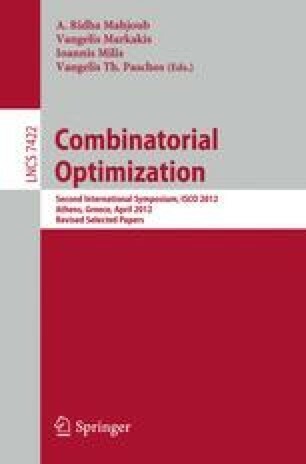 Two Integer Linear Programming (ILP) formulations of TUAP are presented together with their relaxations. One is the Linear Programming (LP) relaxation of the model and valid inequalities are introduced for strengthening it. The other is based on the Lagrangian approach. Constructive heuristic algorithms, based on the previously considered relaxations, are proposed, and their solutions are improved by applying local search procedures. Extensive computational results on real-world instances are reported, showing the effectiveness of the proposed bounding procedures and heuristic algorithms.